In 2012, xMOOCs rose from the laboratories of computer scientists who brought a machine learning approach to education. These xMOOCs or instructivist MOOCs were best know for their re-creation of the lecture as video, computer graded assessments and very little to no interaction with the professor. While technology can certainly enhance some aspects of learning, researchers have written about the sense of loneliness that online learners experience. It is this lack of human connection that leads to attrition. The literature reveals that the technology tools and pedagogical practices utilized in MOOCs vary from those used in more traditional online education and that methods of content delivery and instruction may be different as well. Online courses may include a variety of instructional approaches and meaningful interactions. “Interactions have a direct influence on learners intellectual growth” (Hirumi, 2002). Responding, negotiating internally and socially, arguing points, evolving ideas using alterative perspectives, and solving real tasks leads to meaningful interactions (Jonnassen et al, 1995, Lave & Wenger, 1991, Vygotsky, 1978). Emerging technologies and creative thinking about teaching and learning calls for the use of emerging pedagogies that specifically brings about meaningful interactions. Our MOOC design team, committed to the belief that education is not just about knowledge dissemination but that education is about the intellectual exploration of the learner that ultimately benefits society. Therefore, the HumanMOOC design team gathered to discuss the impacts that xMOOC models of delivery could have on online education if online instructors perceived these as possible examples of quality and value. While we applauded the achievements of these scientists in their development of more efficient systems, but we had serious concerns about pedagogy and learner support. Our HumanMOOC design goal was to create a community space where ideas could be shared. The description of the course made it clear that instructors who teach online from multiple institutions and many disciplines would be the ideal candidates for the MOOC. The Canvas Learning Management system hosting the course served as the embedded learning space for the learners to share their thoughts and ideas. This space became the private “members-only” sharing community for participants who are not comfortable sharing their ideas and comments out on the open web. However, in true connectivist fashion we also encouraged participants to share their learning openly using blogs, twitter, and other technology tools which we called exoskeletal learning. Using a dual-layered design (embedded and exoskeletal) our team created the #HumanMOOC learning environment. Inside the LMS, tucked away from the open web was a rich community of practice learning about the community of inquiry where each week of the course was designed to focus on the various presences (teaching, social, and cognitive). The learning design inside the LMS was social constructivist, where participants learn by “doing”. The HumanMOOC community brings together thought leaders who are passionate about the topic of humanizing online instruction. Wenger et al (2002), discusses designing for communities for “aliveness”, as all communities require interaction in order to become living, collective repositories of knowledge. This design allows for “participating in group discussions, having one on one conversations, reading about new ideas, or watching experts duel over cutting edge issues. Even though communities are voluntary and organic, good community design can invite, even evoke, aliveness.” And, since these communities are not limited by institutional affiliation, the diversity of the community itself adds to the variety of the ideas shared within (Wenger et al, 2002, p.4). In the exoskeletal portion of the course, there is more of a connectivist design to the learning experience. For those who participate in the exoskeletal layer the learning is more rhizomatic, where the community is the content. It is this intentional community cultivation through communications like; live events, regular announcements, discussion posts, blogging, twitter chats and more that keeps the community informed and communicating. When designing a MOOC the participants are unknown so it becomes important to assume that everyone will enter the MOOC with various levels of background knowledge and experience (Macleod, Haywood, Woodgate, & Sinclair, 2014). This variety creates a serious challenge for the design team who must create structured learning experiences for novice students while ensuring more personalized learning pathways that induce critical thinking for more advanced students. Course materials inside the learning management system (LMS) are designed as a scaffolded social constructivist course that can stand-alone; however, elements that engage learners in connectivist learning are found outside the LMS in most cases. There is no clear typical learning design of a cMOOC. This type of MOOC can be loosely structured by the week, and courses are open, messy, and lack a clear method of assessment of learning outcomes since the objectives or learning goals are defined by the learner (Kop, Fournier, & Mak, 2011; Stewart, 2013). cMOOC learners often state that cMOOC courses lack a coherent structure or summary of learning and describe them as being chaotic. Researchers have found cMOOC courses provide fuzzy or messy learning opportunities with flexible, open, disruptive, unpredictable tasks that create tension and anxiety which are an essential part of the transformative process (deWaard et al., 2011; Kop et al., 2011). These concerns regarding connectivism and the chaos of messy learning are addressed in the embedded design of the HumanMOOC, yet still messy learning is strongly encouraged in the exoskeletal layer of the course. While the course is structured in a very linear, logical weekly format the learning is intended to stretch far beyond the LMS into the blogosphere and beyond. Social media tools are essential to MOOCs as they promote connectivity, communication, and interaction (deWaard et al., 2011), and they increase course enrollment through social networks as friends and colleagues recommend the course to one another (Stewart, 2013). Learners are also using their mobile phones to access materials and learning via the Internet at an increased rate (deWaard et al., 2011; Williams, Karousou, & Mackness, 2011). The guiding principles for an open, social, connected course, according to Couros (2009), are that instructors assume the role of facilitators and social connectors rather than that of lecturers or knowledge delivery systems. Learners in these courses engage in social knowledge creation and participate in collaborative activities. In addition, learners should be provided assignment choices to allow for alignment between an individual’s personal and/or professional goals and course outcomes. It is expected that connections developed between learners and course facilitators across social networks should outlive the course. Learners can leverage emerging technology tools to consume and create content and reflections on personal learning experiences that can be shared across distributed networks using Twitter, Blogs, LinkedIn, and other social media tools. Online synchronous events draw a community of learners together and help grow MOOCs because community members typically invite their colleagues, friends, and classmates to join the event and thus expand the community. Adams et al. (2014) confirmed Cormier’s notion of MOOCs being event-based learning experiences, much like attending a sporting event, and that it is this eventedness that contributes to their uniqueness. The embedded course design was intended to be social constructivist and to cultivate a community of practice. Upon reflection and using methods employed in Conole, Dyke, Oliver, & Seale (2004) the course activities were evaluated using the sliding scale to determine the degree to which each element within the course is individual or social, reflective or non-reflective, and informational or experiential. After evaluating each individual activity an aggregate mean was determined for each broad activity category (see Table 1). By developing this reflective model of the course the designers were able to visualize and categorize the learning theory based upon the octahedron models presented in Conole et. al. 2004. The final score in the table above was aligned with the model of the Communities of practice. Leveraging Conole’s applied reflexivity approach allowed us to reflect on the design of the course and ensure that the intended design was explicit. 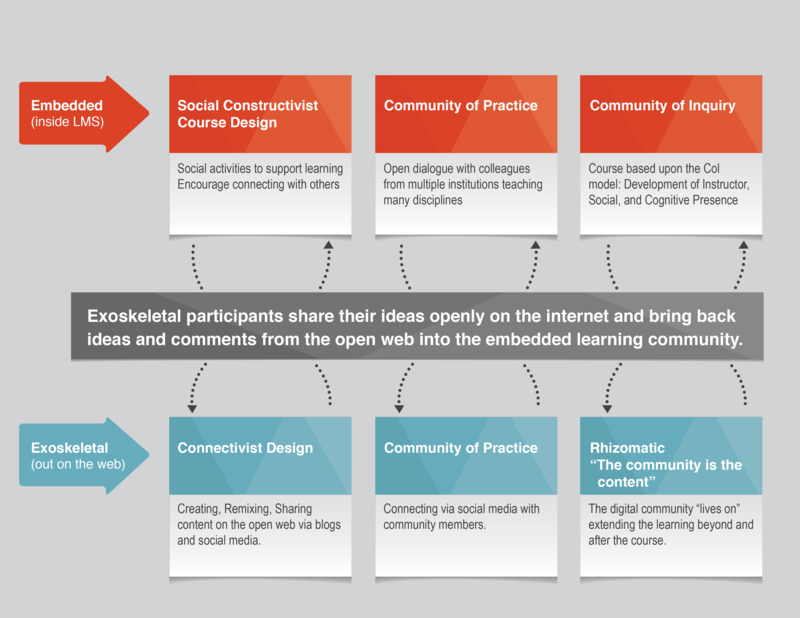 Considerable reflection into the learning design of HumanMOOC revealed that the course was indeed a community of practice as seen in the figure below. The post above is an excerpt from a journal article that I co-authored with Dr. Robin Bartoletti and is currently under review by the editor of the journal. Dr. Bartoletti and the editor of the journal have given me permission to share this pre-publication excerpt from that larger work in order to clarify some of my initial reflections on the design of the HumanMOOC which was taught in 2013. The course was taught again in Spring of 2015 and that data is not yet available. Couros, A. (2009). Open, connected, social–implications for educational design. Campus-Wide Information Systems, 26(3), 232-239. Hirumi, A. (2002). Interactivity in distance education: Current perspectives on facilitating e- learning. Quarterly Review of Distance Education, 3(2), v-viii. Jonassen, D., Davidson, M.,Collins M., Campbell, J. & Haag, B. B. (1995, January 1). Constructivism and Computer-Mediated Communication in Distance Education. American Journal of Distance Education, 9(2), 7-26. (ERIC Document Reproduction Service No. EJ512278) Retrieved on March 6, 2009, from ERIC database. Kop, R., Fournier, H., & Mak, J. (2011). A pedagogy of abundance or a pedagogy to support human beings? Participant support on massive open online courses. The International Review Of Research In Open And Distance Learning, 12(7). Macleod, H., Haywood, J., Woodgate, A, & Sinclair, C. (2014) Designing for the unknown learner. EMOOCs 2014 European MOOC Stakeholders Summit, Experience Track 245-248. Wenger, E., McDermott, R., & Snyder, W. (2002). Cultivating communities of practice. Boston: Harvard Business School Press. I see many references that I am familiar with, so you have probably run into the papers concerning the debate over whether connectivism is separate theory or just a new flavor of social constructivism. Of course, I tend to look at connectivism as a separate theory, but there are good points from those that don’t (even if I disagree). So what would be your response to those that say this can’t be dual layer because its two flavors of the same theory? I like the idea of using the dual layer model to span other paradigms beyond the instructivist/connectivist ones we did in DALMOOC. Many more possibilities there.